My first true RPG experience was Final Fantasy on the NES, which lead me to believe that all RPGs should be like Final Fantasy. Later in life I found that belief quickly losing ground to the new belief that an RPG can take many forms, and as long as it’s enjoyable I don’t really care what game it may borrow it’s style from. 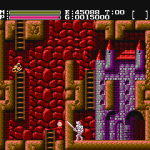 Enter Faxanadu, an Adventure/RPG for the NES, developed by Hudson, that felt more like Metroid and Castlevania than it did Final Fantasy or Dragon Quest. 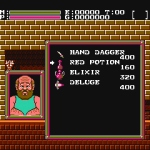 For many American RPG fans Faxanadu seemingly came out of nowhere, yet Faxanadu is reportedly a spinoff of a much larger series called Dragon Slayer. 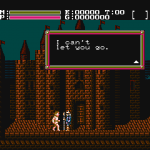 I don’t know much about the Dragon Slayer series other than both Faxanadu and Legacy of the Wizard are supposedly the only parts of the series that made their way on to the NES. 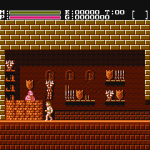 I do own Legacy of the Wizard, I just haven’t delved too deeply into it, so for now I will continue with Faxanadu. 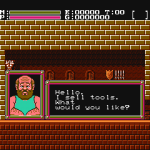 The game starts with the hero returning to his home village, only to find out many things have gone wrong in his absence. And as with any good RPG you are requested by the king to adventure out and set things right again, restoring peace and harmony to the lands once more. I feel that sums up every RPG in the 8-bit era, but you know what? It worked, and all of them put their own spin on that plot as well as made that single, overused plot enjoyable! 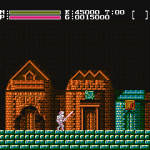 So in a more Metroid than Dragon Warrior Adventure/RPG way you set off going screen by screen collecting items, battling monsters and even visiting villages that offer new equipment and even spells. Along the journey you will collect exp and money from Monsters, which is vital for gaining levels and obtaining new armor, weapons, spells, keys, etc. Sometimes there are little tricks thrown in that will have you hopping back and forth between screens to obtain a special potion or other items. 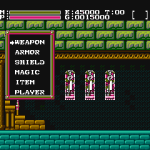 Instead of a battery save Faxanadu uses a mantra system, which is nothing more than a password given to the player by visiting a priest in any given town. 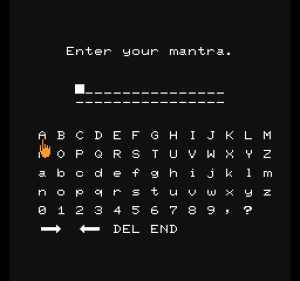 This password system leaves a bit to be desired as once the mantra is reentered the player will start from that church with the items, spells, etc. they left off with, but not all their exp or gold. 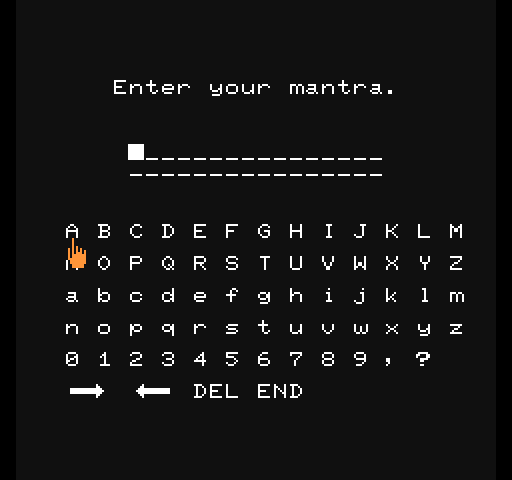 Each mantra reverts the player back to a predetermined amount of exp and gold for the last level they obtained after acquiring a new mantra. 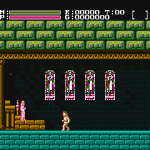 Fighting in Faxanadu is fairly straight forward, you simply press the button and attack what is in front of you. Sometimes, although rarely, you may need to use some clever tactics to defeat a foe, but nothing ever felt like it was impossible to slay; difficult, but never impossible. Which leads me to the leveling (aka Rank) system, which is quite straight forward and standard, yet a bit frustrating. Even though the Rank system is capped at 16 it does require some periodical grinding. After you’ve obtained the next level it is highly advised, by myself, that you return to a priest in any given town to acquire a new mantra, thus saving your new rank and game progress. If you happen to die before obtaining a new mantra you will lose all extra progress toward your next level. But also, as stated above, mantras will only retain a base level and base amount of gold, any exp or gold gained above that, without acquiring a new level, will be lost. 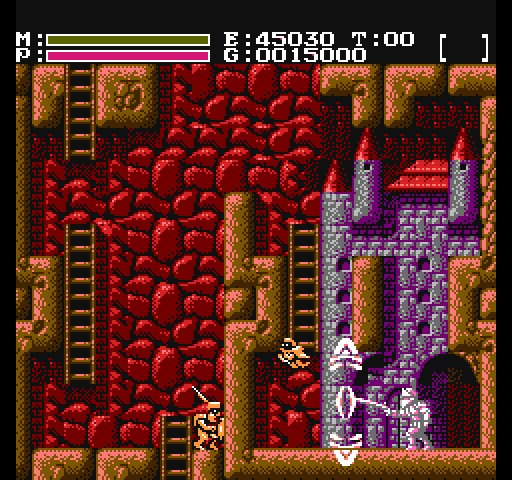 Although not robust Faxanadu does offer the standard RPG fair, an increasingly difficult set of challenges/monsters, an increasingly better set of armor, weapons and spells, as well as a handful of back and forth missions. But one thing Faxandu has that is unique is the key system used to unlock new areas. 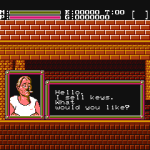 Keys can be acquired from shops within the towns, but beware as you can only hold so many items. Plus the fact there are multiple types of keys; most of the time you have no way of knowing how many of each keys you’ll need to progress, and all used keys are gone forever. Once you’ve defeated the final boss and restored peace to your village everything is perfect once more. At least I assume so, I mean we did just go through the whole game and took care of the reason everything was a mess in the first place. Faxanadu doesn’t quite fill up the same time as Final Fantasy or Dragon Quest would, but it’s definitely a great game to play and very enjoyable. 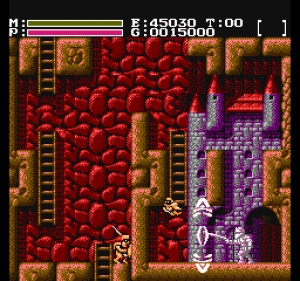 Replay-ability may not seem likely, but give it some times and you’ll find yourself going back into the world of Faxanadu just to relive the adventure you had the first time around. Trust me!